Rosewill GUNGNIR Gaming Computer Case Review | Nerd Much? Showing off your rig is half of the fun in building it; after all, what’s the point of having a badass gaming PC if you can’t brag about it to your friends. 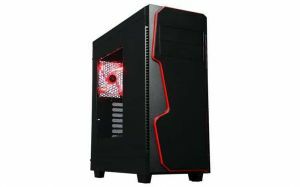 One of the essential components required when building a PC is the case itself, and it’s one that is frequently purchased last when building a PC, being treated like an afterthought because, well, most people don’t really care all that much about their case. But there’s actually a lot of neat ideas that can be implemented, and as Rosewill proves with the GUNGNIR case, putting actual thought into a computer case pays off. There are a lot of little touches that makes the Rosewill GUNGNIR great. First and most immediately noticeable is the case’s cable management, which allows you to have only a couple of wires and cables visible thanks to a few innovative designs. 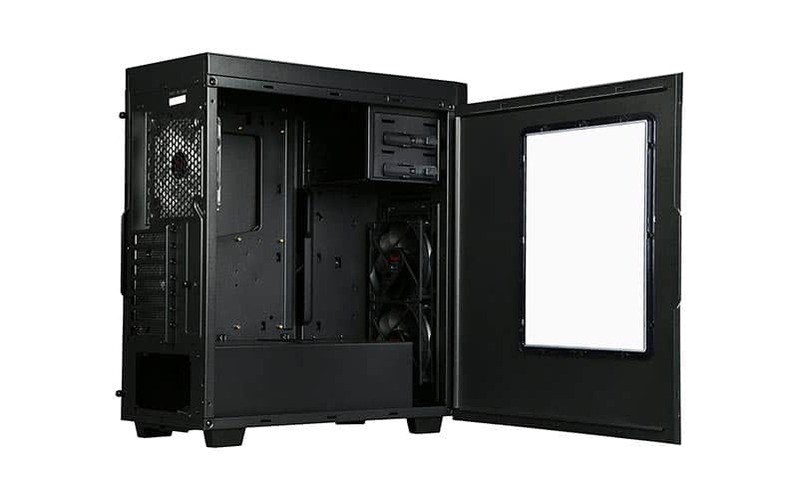 The case has a unique PSU chamber that is spacious and allows you to distribute only the cables you need outside of the housing, keeping the remaining cables hidden away. It also helps that the HDD and SSD bays are hidden on the back of the case (the side that typically goes unused), meaning the cables are shoved into the back instead of being visible/clogging up around the motherboard. It has pre-installed housings for two 2.5″ SSD drives and two 3.5″ HDD, and the HDDs sit on a slide-out metal housing that makes them easily removable and replaceable. This cable management system is on an entirely new level, and for a budget-priced case, it’s a feature that I’ll no longer go without in the future. It also helps that the case is pretty sizeable, with plenty of interior space. In fact, you can fit graphics cards up to 400mm in length, and that card will still have plenty of room to breathe. The GUNGNIR case also has cleanliness at the forefront of its design, as it has three easily removable dust filters (one on the top, front, and rear). This makes maintenance and upkeep a breeze, allowing you to keep your PC clean and running smoothly. The case comes with three pre-installed fans, two in the front blowing air into the case and one in the rear blowing hot air out. There is also room for two more fans on the top, although the actual fans aren’t included. On the top of the GUNGNIR, you’ll find some useful I/O ports, including two USB 2.0s, two USB 3.0s, Audio In/Out, and an interesting fan-speed control knob that makes changing the fan speed bios-less/softwareless. As far as the physical appearance of the GUNGNIR is concerned, the red and black design looks great. The case also has a red glow, thanks to the LEDs on the fans. Its design is certainly commendable, and for a low-cost case, it has a lot of interesting design choices that not only make it look great but make it highly functional as well. The GUNGNIR is available now for $54.99 via Amazon and other outlets. Small viewing window on the side of the case should be bigger to show off the cool innards.